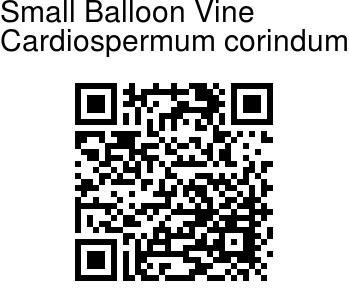 Small Balloon Vine is a small perennial herbacious creeper which can be often confused with the more common Balloon Vine. Stems are slender, deeply furrowed, finely grey-downy. Leaf stalks are almost non-existent. 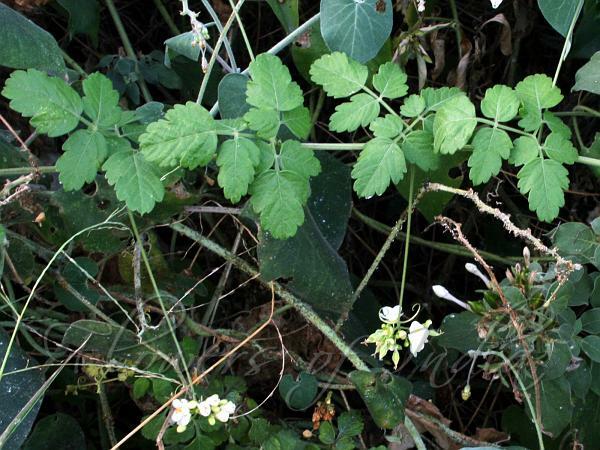 Leaves are biternate - trifoliate with the leaflets divided again into 3 leaflets. The lateral divisions may sometimes be reduced so that they appear like pinnae. Leaflets are ovate, deeply cut, the color a duller green and the texture firmer than in the others, and especially the lower surface always downy, with the main veins a little raised. The terminal leaflets easily distinguishes this plant from Balloon Vine. In Balloon Vine, the terminal leaflet is ovate, with a broad base and narrow tip - in Small Balloon Vine, the terminal leaflet has a narrow tapering base. Flowers are borne in groups of 2-6, the clusters carried on very long, slender stalks. Fully developed flowers are nearly 6 mm long, the larger sepals equalling the white petals, the filaments slightly hairy and the glands oblong. Capsule are distinctly stalked, roundish in general outline, measuring 2.5-3.1 cm each way. Photographed in Maruthamalai, Coimbatore, Tamil Nadu.